When I first moved to Charleston, South Carolina all of my co-workers and I went out to lunch at one of Charleston’s oldest restaurants named 82 Queen. It was the first time I ate (or heard of!) Shrimp and Grits. What a great dish! I’m not sure how it started, but it is our family tradition to serve this delicious southern dish on Easter. This recipe is adapted from another restaurant in Charleston named Hominy Grill. It is my favorite version of this dish. Years ago when we served it to guests there was a comment that every bite has different layers of flavor- SO GOOD! I serve it over cheese grits. Prepare grits: Boil milk, then add grits in a slow stream. Stir and cook approximately 20 minutes, until thick. Add salt, pepper, and cheese. Cover and keep warm while cooking the shrimp. Fry bacon until crisp, remove from pan and reserve; pour off all but 1 T of fat. Gently toss shrimp with flour until lightly coated; remove excess flour. Add oil to pan with bacon fat and heat over medium high heat. Add shrimp and sauté until half-cooked. Add mushroom and toss. When they begin to cook, stir in reserved bacon, add garlic but do not let brown. Then very quickly stir in the hot sauce and lemon. Cook until the shrimp are pink on both sides and mushrooms are golden brown. Season with salt, add green onions and then remove from heat. 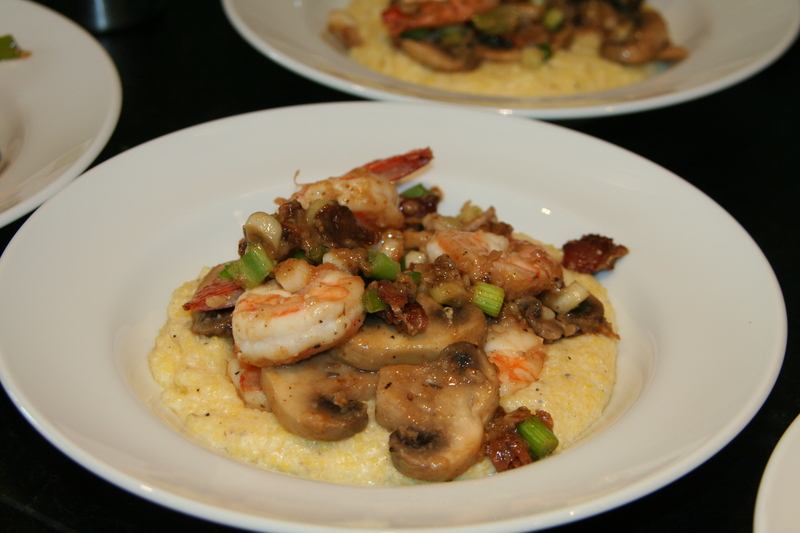 Spoon shrimp mixture over grits. Serve immediately.